- Hop On Hop Off Tour plus 10% discount on all Scenic rides Skyway, Railway and Cableway. - Chinese Garden of Friendship Entry. - Featherdale Wildlife Park Entry. - Hyde Park Barracks Museum Entry. - Jenolan Caves - Cave Tour. - Justice and Police Museum Entry. - 2 hour Bike Ride. - Museum of Sydney Entry. - Observation Centre at Homebush Bay Entry. - Ocean World Manly Entry. - Your choice of entry to 7 top attractions in and around Sydney. - 7 tickets valid for single entry. 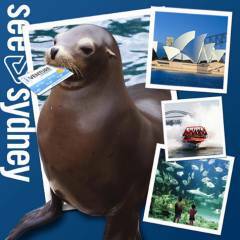 - Museum of Sydney Entry..
- A $20 supplement is payable to the operator on weekends, NSW School Holidays and Public Holidays for some attractions. Please contact us for more details.